So what’s up with the title you ask? Well, over at Splitcoast today it’s the Ways to Use It Challenge and we’re to use our favorite things. If you look back over my cards…you’ll see a lot of Tim Holtz products. My collection continues to grow ’cause I just love everything Tim!!! I’ve started out with a standard A2 card base in SU! Soft Suede. Next comes a piece of Kraft Core card stock that’s been dry embossed. Then it was sanded, distressed, the sponged. Then for just a little more texture I used that says “believe”, I wasn’t looking for the word to show up so much as I loved the texture from the stamp. 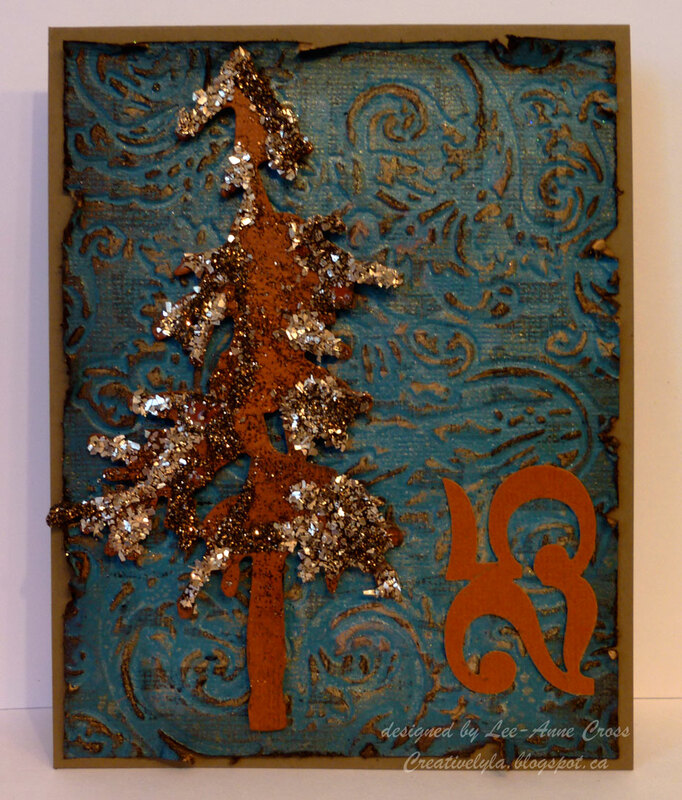 The tree is cut from a yes…you guessed it…Tim Holtz die. I used a different color of Kraft Core this time. I stamped over the tree at a diagonal and then added some Ranger Glossy Accents and two different glitters. It was adhered with dimensionals. Then the “25” was die cut and adhered with my Xyron Sticker Maker. I wanted something that was easy to mail and this fits the bill and actually a very simple card to make. This card is also for the Queen for the Day Challenge over at Splitcoast where we are honoring Pam MacKay. I chose this card of Pam’s to case. I used a tree and the “25” and a little of the color but pretty much everything else is different.